Karren Erickson helps a patron with a HEAT application Wednesday afternoon. She said they are booked up until January but, they can help people in emergency situations. The early cold weather has caused Bear River Association of Governments (BRAG) to be extra busy with heat assistance, said a HEAT Intake Worker, Karren Erickson. 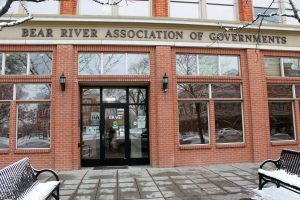 Bear River Association of Governments (BRAG) at 170 N Main is extra busy this time of year with HEAT assistance applications. HEAT stands for Home Energy Assistance Target (HEAT) program. The program provides winter utility assistance for low-income households, targeting those who are vulnerable. BRAG tries to help the lowest-income households with the highest heating costs, the disabled, elderly, and families with preschool-age children. The service is funded through the U.S. Department of Energy Low-Income Home Energy Assistance Program (LIHEAP). She said the information is all online, people can mail in an application or they can fill it out online. They must fax all of the information that they are giving in order to make it valid. 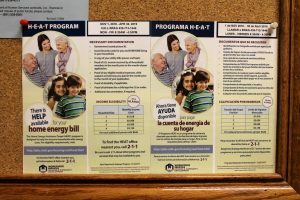 A HEAT brochure is pinned to a bulletin board at BRAG office in Logan. “When they call for an appointment we send them a letter that verifies the date and time of the appointment,” Erickson said. “We give them a list of everything they need to have with them when they come in. If someone is disabled or handicapped and can’t come into the office they do have an outreach program where they send someone into the home. 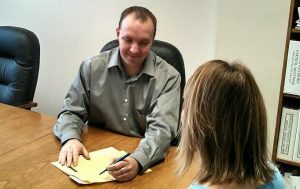 Qualified home owners from Cache, Box Elder and Rich Counties can apply from November to April. Appointments are scheduled on a first-come first-served basis beginning November 1st. The assistance is a one-time payment, so it is best to come in when the heating bill is generally highest, like in December or January, but people can come in as late as April and apply, she said. Lucas Martin, BRAG Human Services Specialist, said HEAT provides assistance to low income households to help with their utility bills. He said they can deduct some expenses, like medical bills and prescriptions. Households in Box Elder County should call (435) 723-1116 to schedule an appointment. For Cache and Rich counties they should call (435) 713-1444. “Even if you don’t need the help, you may know someone who does,” Martin said.